Back pain or flank pain usually a result of musculoskeletal problems but often can be a sign of kidney pain. 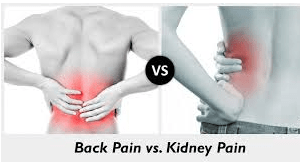 It is difficult to diagnose the lower back pain as a pain in the kidneys. The kidney pain felt under the ribs and is deeper than muscle pain. Back pain caused by muscle strain is down from where the pain caused by the kidneys. How do I differentiate between low back pain resulting from total pain and pain caused by muscle problems? If the pain moves towards your side and groin area. Urine analysis show pus cells and protein which is a sign of infection especially with painful urination and fever. Ultrasound show kidney stones even if there is no crystals in the urine or blood cells. Elevated creatinine is a strong sign of kidney disease which can be a cause of flank pain. However backpain will not rise creatinine levels unless the pain is caused by a disease in kidneys. So that, flank pain with normal creatinine should exclude that the pain is due to renal disease but it can be a result of muscle stain or other muscle problems. Retention of fluids as a result of failure of kidneys to eliminate water waste will cause swelling of your legs, ankles, and feet. pain in your chest with unexplained shortness of breath. for your question go to facebook page.